Lin, J., Xue, F., and Zhao, G. (2019). "Soda lignin-based activated carbon and its adsorption properties," BioRes. 14(1), 376-386. Soda lignin-based activated carbons (AC) were successfully prepared through chemical curing with hexamethylenetetramine (HMTA), followed by carbonization and steam activation. The pore structure, surface chemical structure, and adsorption properties of the ACs were investigated. The obtained ACs exhibited a high specific surface area (SBET) and total pore volume (Vtotal), which first increased and then decreased with an increasing HMTA concentration. The highest values were approximately 1800 m2/g and 1.0 mL/g, respectively. The SBET and Vtotal were comparable or superior to those of ACs prepared with various activation methods reported in the literature. By increasing the HMTA concentration, the amount of graphitic carbon, which was the main compound on the surface of the ACs, decreased and then slightly increased, while the functional groups containing C-O showed the opposite tendency. Additionally, the great adsorption capacities of the ACs for methylene blue and iodine were mainly related to the carbonyl group chemical structure and pore structure. As one of the main cell wall components in higher plants, lignin is the second most abundant renewable bioresource next to cellulose. In general, various types of lignin, such as lignosulfonate, soda lignin, organosolv lignin, kraft lignin, and hydrolysis lignin, can be obtained from the pulp and paper making process. More than 50 million ton of this lignin is produced annually, but less than 5% of that amount is effectively utilized as surfactants, films, foams, etc. (Mai et al. 2000). Most lignin is burned as fuel to produce energy or discharged in the form of black liquor, which results in waste and pollution. Considering the high carbon content, lignin has been thought to be one of the best raw materials for the preparation of carbonaceous materials. Lignin is biosynthesized from the precursor of three monolignols and has an isotropic structure, which is considered to be an ideal precursor to form pores in lignin-based carbonaceous materials during activation processes (Suhas et al. 2007). Thus, it is an important process to convert lignin to high value-added porous carbonaceous materials. As one of the most important members in the carbon family, activated carbon (AC) possesses a well-defined porous structure and huge specific surface area (SBET), which leads to good adsorption capacities of various substances. Thus, AC is widely utilized in several fields, such as purification, catalysis, separation, storage of natural gas, and production of electronic materials (Suzuki 1994; Jain et al. 2016). In general, various materials, including coal, pitch, wood, coconut shell, and peat, are commonly used for the preparation of AC (Juang et al. 2000; Kennedy et al. 2004; Sun et al. 2012). However, coal and pitch are costly and not environmentally friendly because of the decreasing reserves of fossil fuels and negative effects from their use. Furthermore, the usable bioresources from wood and coconut shell are limited, which makes it difficult to fulfill the requirements. Thus, more attention is being paid to waste lignin from industries, as it is low-cost and a renewable raw material for fabricating ACs because of its abundance and sustainability. The principal processing steps for preparing AC typically consist of carbonization and activation. Naturally, the specific AC production process depends on the raw materials. In the case of lignin, chemical activation methods have often been conducted to activate as-prepared carbon materials because of the high SBET and total pore volume (Vtotal), while ACs with a less porous structure are obtained by gas activation, such as steam and carbon dioxide activation, because of lower levels of activation (Rodríguez-Mirasol et al. 1993; Gonzalez-Serrano et al. 1997; Zou and Han 2001; Carrott et al. 2008; Torné-Fernández et al. 2009; Sun et al. 2010). However, the chemical activation method is considered tedious and costly, as well as environmentally unfriendly. In this study, industrial soda lignin was chosen as the raw material for preparing AC. A motivation for selecting soda lignin for this work is that it is sulphur-free in comparison with industrial kraft lignin and lignosulphonates. To prepare AC with a more porous structure by steam activation, chemical curing with hexamethylenetetramine (HMTA) was performed on industrial soda-lignin before carbonization and activation. The pore structures and surface chemical structures of the obtained ACs were characterized. Furthermore, the adsorption capacities of methylene blue (MB) and iodine were determined and the relationships between the structure and adsorption properties were analyzed. Black liquor powder was obtained from FeiWong Xinyi Chemical Co., Ltd. (Jiangsu, China). First, the powder was dissolved in purified water to prepare the black liquor. Prior to use, the black liquor was filtered through filter paper to separate the filtrate and residue. After filtering three times, 6 M hydrochloric acid (HCl) aqueous solution was slowly added into the resultant filtrate with continuous mechanical stirring until the pH was approximately 2. The precipitate was then collected by centrifugation at 2270 g for 15 min. Finally, the soda lignin powder was obtained by freeze drying. Chemical curing of the resultant soda lignin was performed with HMTA. The soda lignin powder was immersed in HMTA aqueous solutions with concentrations of 5 wt.%, 10 wt.%, and 15 wt.%. The aqueous solutions contained 6 M HCl. The mixture system was then heated with continuous magnetic stirring at 70 °C for 2 h. After the treatment, the mixture was filtered through filter paper to separate the filtrate and residue. Cured soda lignin powder was obtained from the residue by washing it with distilled water and then drying it under vacuum at 45 °C for 12 h.
Subsequently, the resulting cured soda lignin was carbonized in an electric tube furnace (SERIES 1500, Thermcraft Incorporated, Winston-Salem, USA). The lignin was heated from room temperature to 900 °C at a heating rate of 4 °C/min and then held at 900 °C for 1 h under a N2 stream at a flow rate of 0.2 L/min to obtain lignin-based carbon. The resulting carbon was subjected to activation to prepare the ACs. The carbon was heated in an activation furnace (self-made by Beijing Forestry University, Beijing, China) from room temperature to 900 °C under a N2 stream at a flow rate of 0.2 L/min. When the temperature reached 900 °C, N2 was mixed with steam (flow rate = 3.1 g/min) and the mixed gas was introduced into the activation furnace for activation at the final temperature of 900 °C for 1 h. The samples cured with HMTA concentrations of 0 wt.%, 5 wt.%, 10 wt.%, and 15 wt.% were referred to as AC-0, AC-5, AC-10, and AC-15, respectively. The surface morphologies of the ACs were observed with scanning electron microscopy (SEM) (S-3400N, Hitachi, Tokyo, Japan) at an accelerating voltage of 5 kV after being coated with gold using an ion sputter (Hitachi E-1010). An Autosorb-iQ (Quantachrome Instruments, Boyton Beach, FL, USA) was used to determine the N2 adsorption-desorption isotherms of the ACs at 77 K. Prior to measurement, the moisture and volatile compounds in the pores of the samples were removed by heating at 300 °C for 4 h under vacuum. The Brunauer-Emmett-Teller (BET) model was used to calculate the SBET of the samples from the N2 adsorption isotherms over the relative pressure (P/P0) range of 0.05 to 0.30 (Okada et al. 2003). The adsorption at relative pressures of 0.1 and 0.995 are equal to the volume of the micropores and the Vtotal of the micropores and mesopores, respectively (Rodriguez-Reinoso et al. 1982; Shimada et al. 2000). The micropore area (Smicro) and mesopore area (Smeso) were calculated according to the t-plot and Barrett-Joyner-Halenda methods, respectively. The pore size distribution was calculated using the density functional theory method (Lastoskie et al. 1993), which is based on the calculated N2 adsorption isotherms for the different pore sizes. The X-ray photoelectron spectroscopy (XPS) measurements were performed on a spectrophotometer (ESCALAB 250Xi, Thermo Fisher Scientific Inc., Waltham, USA) with a monochromated Al K α X-ray source (hν = 1486.6 eV) to determine the number and type of functional groups present on the surfaces of the ACs. A current of 10 mA and a voltage of 13 kV were used. The survey scans were collected over the binding energy range of 0 eV to 1350 eV. A nonlinear least squares regression analysis program (XPSPEAK Software, Version 4.1., Informer Technologies, Inc., Hong Kong, China) was used for the XPS spectral deconvolution. Liquid-phase adsorption tests for the ACs were conducted using MB (CAS#7220-79-3) and iodine (CAS#7553-56-2) as the adsorbates. The adsorption capacities of the MB and iodine solutions were measured according to a Japanese national standard JIS K 1474 (2007). Samples were mixed with 25 mL of methylene blue solution (1200 mg/L) and 50 mL of iodine solution (0.05 mol/L) in a 100 mL of conical flask, respectively. The mixture was shaken for 30 min in a water bath (25 oC) with a shaking rate of 150 rpm. There were at least two replications for each sample to obtain the corresponding adsorption values (Shimada et al. 1999; Small et al. 2012). The lignin-based ACs were prepared from soda lignin powder as the raw material by chemical curing and carbonization, as well as steam activation. Figure 1 shows the different morphologies of the resulting ACs. In Figs. 1A and 1B, the AC prepared without chemical curing presented a large covering on the surface, which may be caused by ash from the soda lignin with a low thermal stability during carbonization and the activation process with a high treatment temperature. The covering prevented steam from further activating the lignin-based carbon, which is thought to be a disadvantage when attempting to prepare AC with a porous structure. It was concluded from these results that more pores could be obtained if the covering is removed from the surface. Therefore, chemical curing of the soda lignin was performed. As was expected, almost no obvious covering existed on the surfaces of the ACs that were chemically cured with HMTA. They had rougher surfaces and developed pores that were clearly observed. These results were also quantitatively demonstrated by the N2 adsorption-desorption measurements. The isotherms of N2 adsorption-desorption at 77 K of the obtained ACs prepared with and without chemical curing are shown in Fig. 2. For AC-0, almost no uptake of N2 was observed at a low relative pressure (P/P0 < 0.05) and the volume of adsorbed N2 linearly increased with an increasing relative pressure, which implied that AC-0 may have had a few mesopores, but no micropores. Comparatively, the ACs prepared with chemical curing adsorbed large volumes of N2, which revealed that many pores had developed. The volume of adsorbed N2 first increased and then decreased as the HMTA concentration increased. Moreover, the N2 adsorption-desorption isotherms of the resulting ACs were completely different from that of AC-0 and were type IV according to the IUPAC classification (Khalili et al. 2000). When the relative pressure was low (P/P0 < 0.05), the main uptake of N2 occurred. This indicated that many micropores were present in the as-prepared ACs. Furthermore, it was observed that hysteresis loops (H4 type) existed in the isotherms of the ACs prepared with chemical curing from the relative pressures of 0.45 to 1.0, which suggested the existence of larger amounts of mesopores (Qian et al. 2007). The SBET and Vtotal were collected from the N2 adsorption-desorption isotherms of the corresponding ACs (Table 1). The AC-0 exhibited low SBET and Vtotal values because of relatively low activation caused by the ash produced from the soda lignin with a low thermal stability. When chemical curing was performed, the resulting ACs showed extraordinarily greater SBET and Vtotal values than those of AC-0. The SBET and Vtotal values first increased and then decreased with an increasing HMTA concentration. This may have been caused by the extent of formation of the cross-linkages between the lignin molecules through the methylene groups. When a higher HMTA concentration was employed, more formaldehyde was produced from the decomposition of HMTA, thus inducing the formation of more cross-linkages. However, the generation of formaldehyde and ammonia from the decomposition of HMTA is strongly dependent upon the pH of the reaction medium (Swift et al. 2003); when the pH is lower, the amount of formaldehyde generated is larger. More ammonia was produced when 15 wt.% HMTA was used, which resulted in a higher consumption of HCl. Therefore, the relatively less amount of generated formaldehyde participated in the formation of cross-linkages. The highest SBET and Vtotal were 1814 m2/g and 1.024 mL/g for AC-10, respectively, which were comparable or superior to those of ACs reported in the literature that were activated by carbon dioxide (1644 m2/g and 0.610 mL/g) (Carrott et al. 2008), steam (865 m2/g and 0.825 mL/g) (Baklanova et al. 2003), and chemicals (692 m2/g to 1560 m2/g and 0.67 mL/g to 0.97 mL/g) (Hayashi et al. 2000; Fierro et al. 2006; Chiang et al. 2007; Myglovets et al. 2014). These results indicated that the chemical curing process can effectively accelerate pore development. Furthermore, the pore size distributions of the ACs are presented in Fig. 3. Almost no micropores were found and a small amount of mesopores were mainly distributed in AC-0. After chemical curing of the soda lignin, the porous developments of the ACs were different. More micropores with a small amount of mesopores were generated. This suggested that steam activation not only produced new micropores, but it also widened them to mesopores by removing the active amorphous atoms and unsaturated carbon atoms from the edges of the micro-graphitic walls and partially gasifying the micropore walls (Hayashi et al. 2000; Sun et al. 2010). For AC-15, a small amount of covering from the soda lignin with less cross-linkages prevented the steam from causing further activation, which resulted in a smaller amount of micropores and mesopores. This phenomenon was also interpreted by the specific surface areas and pore volumes of the micropores and mesopores (Table 1). The XPS spectra of the ACs prepared with and without chemical curing are shown in Fig. 4A. The major peaks in the AC-0 spectrum were attributed to Na1s, C1s, and O1s photoelectrons. In contrast, the C1s photoelectron was the main peak in the spectra of the ACs prepared with chemical curing, which may have been caused by the removal of Na+ during the chemical curing process and sufficient activation at a high temperature. The C1s spectra for the ACs were similar. Therefore, only the AC-10 spectrum is presented in Fig. 4B as an example. For all of the ACs, the C1s signals exhibited an asymmetric tailing, which was partially attributed to the intrinsic asymmetry of the graphite peaks and the contribution of the oxygen surface complexes. Deconvolution of the XPS C1s spectra produced four individual component peaks, which represented graphitic carbon (284.6 eV to 284.7 eV), carbon present in alcohol, ether, or C=N groups (285.5 eV to 286.2 eV), carbonyl or quinine groups (286.9 eV to 287.1 eV), and carboxyl, lactone, or ester groups (288.1 eV to 288.9 eV) (Chiang et al. 2007). The percentages of the graphitic and functional carbon atoms are summarized in Table 2. The values for the graphitic carbon and oxygen-containing groups showed obvious differences among the ACs. More graphitic carbon existed in AC-0 because there was a lower extent of activation by steam. In contrast, the ACs prepared with chemical curing presented less graphite carbon, which first decreased and then slightly increased as the HMTA concentration increased. The carbonyl groups showed the same trend, while the carboxylic groups behaved in the opposite manner and the hydroxyl groups slightly decreased. It was believed that more graphitic carbons in the ACs reacted with the steam molecules to generate more functional groups containing C-O, which was consistent with the results from the pore structure measurement. 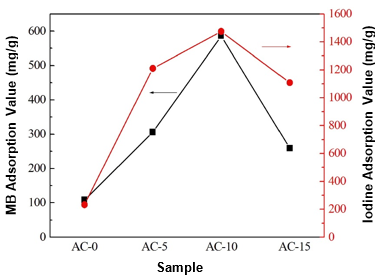 Liquid-phase adsorption tests for the ACs were conducted using MB and iodine as the adsorbates. Figure 5 shows the adsorption capacities of the ACs against the MB and iodine aqueous solutions. The ACs prepared with chemical curing showed higher adsorption capacities for both MB and iodine than AC-0. 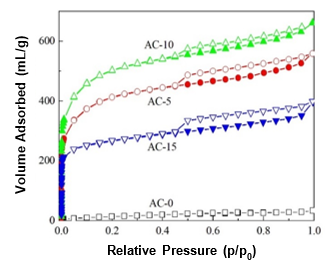 With an increase in the HMTA concentration, the adsorption capacities of the ACs first increased and then decreased, which was in good agreement with the results of the pore structure. The highest adsorption values were 586 mg/g and 1474 mg/g for MB and iodine, respectively, which were five times greater than those of AC-0. This meant the chemical curing process clearly improved the adsorption capacities of the ACs. The MB and iodine adsorption capacities of the ACs in this study were also comparable or superior to those of some biomass-based ACs or AC fibers from previous studies (Small et al. 2012; Lin and Zhao 2016). Accordingly, the chemical curing process could be considered a promising alternative for the preparation of AC with a high adsorption capacity. Furthermore, a correlation between the structure and adsorption capacity was established from the obtained results. Figure 6A shows that the linear fit of the AC pore volume against the iodine adsorption capacity exhibited a relatively high correlation coefficient, especially for that mesopore volume to iodine adsorption value. The correlation coefficient was nearly one, whereas the correlation coefficient from the linear fit of the micropore and mesopore volumes against the MB adsorption value were only approximately 0.8 and 0.7, respectively. Moreover, similar results were obtained from the linear fits of the pore specific surface area against the adsorption values in Fig. 6B, which indicated the major effect of the pore structure on the adsorption of iodine. These trends may have been caused by the different sizes of the MB and iodine molecules. The porous structure of the corresponding AC favored the adsorption of iodine because of its relatively small size (Troppová et al. 2017). Additionally, all of the linear fits of the functional groups, except for C=O, against the adsorption capacity showed a low correlation coefficient, which implied the weak effect of the surface chemical structure on the iodine adsorption capacity. Accordingly, the MB and iodine adsorption capacities may have been mainly related to the chemical structure of the carbonyl groups and pore structure, respectively. Soda lignin was chemically cured with HMTA and successfully converted into AC with a porous structure by carbonization and steam activation. The specific surface areas and pore volumes of the ACs first increased and then decreased with an increasing HMTA concentration. The AC that was chemically cured with 10 wt.% HMTA exhibited the highest SBET and Vtotal at approximately 1800 m2/g and 1.0 mL/g, respectively, which were comparable or superior to those of previously prepared ACs in the literature. Also, the functional groups containing C-O showed the same trend for the SBET and pore volume. The obtained ACs possessed great MB and iodine adsorption capacities, which was thought to be the result of the carbonyl group chemical structure and pore structure in the ACs, respectively. This research was financially supported by the Beijing Municipal Education Commission Co-building Project of Scientific Research and Postgraduate Training for Key Disciplines (2015) and the National Natural Science Foundation of China (No. 31700492), which are gratefully acknowledged. JIK S 1474 (2007). “Test methods for activated carbon” Japanese Industrial Standards Committee, Tokyo, Japan. 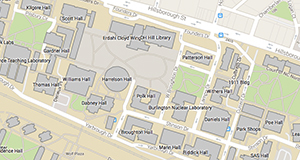 Swift, L. P., Cutts, S. M., Rephaeli, A., Nudelman, A., and Phillips, D. R. (2003). “Activation of adriamycin by the pH-dependent formaldehyde-releasing prodrug hexamethylenetetramine,” Mol. Cancer Ther. 2(2), 189-198. Article submitted: August 15, 2018; Peer review completed: September 23, 2018; Revised version received: November 15, 2018; Accepted: November 17, 2018; Published: November 21, 2018.